Rushing to get this video out. Remember we’ve got Contract rollover happening – that means tomorrow’s trade volume will be split between two different contract months. And all my continuous contract charts need checking. Big up day – and isn’t it sad. Driven by the rumour of more QE – not real stuff, like earnings or a breakthrough drug or mining deposit discovery. No, the promise that the party will go on despite the banks being insolvent and Governments up to their eyeballs in debt they have no intention of paying off. “Hi Barry, A big thanks for your ‘Pro-entry, Pro-exit’ tip, which bagged me 5 points today for a OSOK today… I was in at 1276.75, after buying exhaustion was signalled on the 1500 at 08:37, having had a long bias and seeing a good level at 1281.50 – Monday’s high. 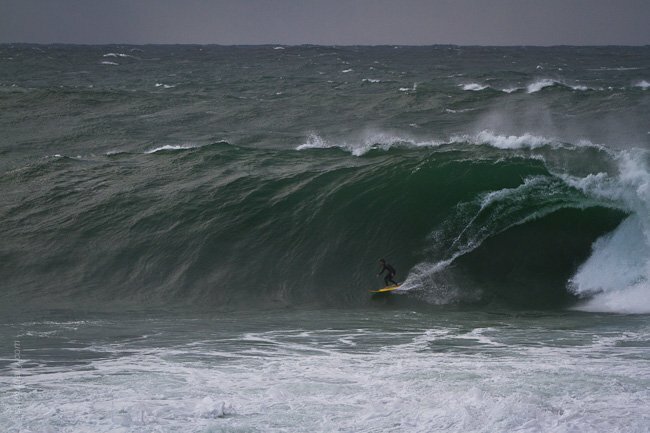 We had a ‘little’ storm rip through Sydney yesterday – and some brave souls made the rest of us feel like wimps. Check these out – the first 2 shots are of a break called Dead Man’s at the south end of the Manly bay – towards the Sydney Harbour entrance. The last shot is of the south end of Manly beach. OK, gotta get this update out and pull the wetsuit on. Photos courtesy of Sprout Daily and SurfPhotosOfYou.